The Fellowship of St Thomas More was founded in 1971 by Rev Hugh Albin, the then Vicar of St Dunstan’s. Coming from Northern Ireland, Rev Albin saw an opportunity for people of different backgrounds from around the world to unite behind and cherish the memory of Sir Thomas More; a man of courage and integrity. The aim of the Fellowship is to encourage research into Tudor times and support for the values upheld by More. A journal is published annually and sent out to all members. The anniversary of More’s execution on Tower Hill is the 6 July. Every year on that date, the Fellowship holds a commemorative, civic service attended by the Lord Mayor and members of the legal profession, with an address by a scholar or public figure. 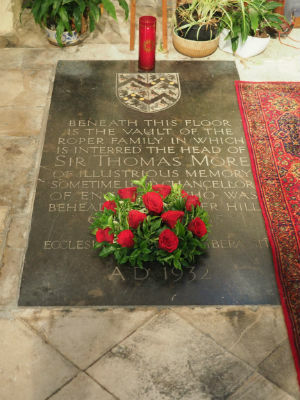 The head of St Thomas More lies buried in the crypt of the Roper Chapel at St Dunstan's Church, together with the remains of his daughter, Margaret, and son-in-law William Roper. Visitors and pilgrims from around the world come and visit St Dunstan’s Church and the Roper Chapel. If you wish to join the fellowship group, please contact us below. The Rector, Rev Jo Richards or use the Contact Us form. Alternatively telephone the number below.